Pocket Bike Forum - Mini Bikes > General Pocketbike Forums > General Pocketbike Discussion > Yep still at it! I decided to because I will be modding and converting it. It will no longer be classified as a scooter when I'm through. As you can see from the pic this thing is pretty big. But there is 2 companies making these scooters. A while back went to a local shop to inspect one. The I saw was a bit lower and had 12" wheels. First off I'm not promoting these. I'm just telling "my experience" with this scooter in my possession. Now I'm not really a street riding person. But I am considering getting this registered as a custom build. 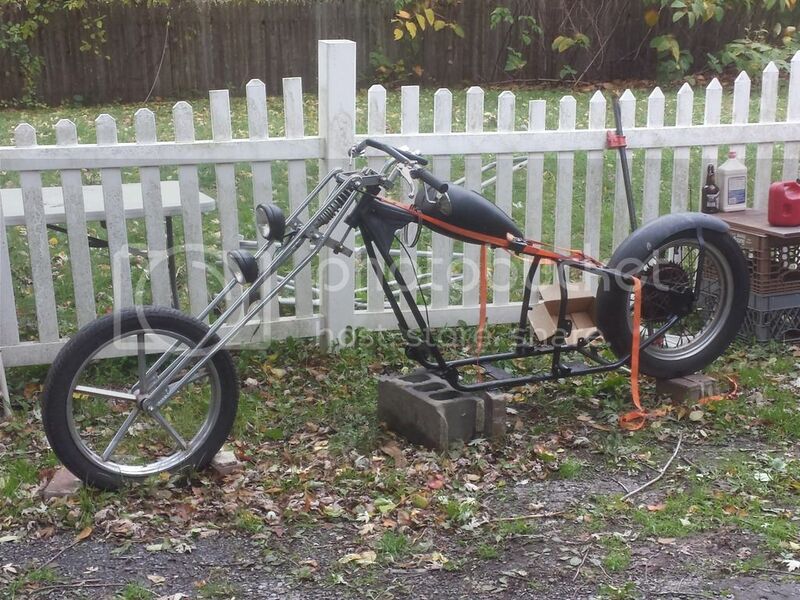 However I am more than likely building this to be a trackday fun bike. I have selected a motor and swingarm. Also possibly some 14 or 15" rims to use for this transformation. I'm not saying what motor and swingarm setup. It could change do to the nature of the build. I will say this though the completed bike will go over the 100mph mark. I'm excited about this project. Because I believe this bike will be good. To use on kart tracks and be able to use it on a full-sized track for fun. My final note, this thing is over 200lbs. It is not as nimble and agile as the mids. In its current state. The motor I'm leaning towards. Will give this bike great power to weight ratio. So she will be good to go. I don't know what happened to the pic. But here it is. Re: Yep still at it! Last edited by CAM2; 12-10-2016 at 03:50 PM. I thought about the possibilities one could do with this bike as I saw it on eBay. Cool project! What motor do you plan on using? Thanks Cam always good to see you and hear from you also.. I'm rounding up all the parts needed before I get started. Right now doing some research on 14" and 15" race tires. Which ever size has offers the best performance tire. Is gonna determine the size rims I choose. To honest I haven't 100% decided on the motor. Only because I wanna make sure I can still go to kart tracks. Not to compete but just to practice. I believe some tracks have cc limits do to insurance. I'm strongly looking at a couple of 250cc twin cylinder 4strokes. Stock HP rating a little over 29hp. I think that should be perfect for this bike. Also a yzf r3 motor, the weight of the motor is a bit of concern though. Then the yzf 450cc single cyl. That would be another great choice. Good power plus weighs less than all the others. Have you looked into a crf150r motor? Its an incredibly well engineered motor. Small but puts out 21-22 hp. The crf150r bike has roughly the same power to weight ratio as the crf450r. Might be hard to get your hands on though. The crf 150r has crossed my mind. I figured since there's a lot of room in this chassis. Plus it the chassis seems to be strong. That I'd go big as possible and with in reasonable costs. Also if I decided to take out on full-sized track. I wanna have a little bit of fun..
Also if I do get plated as a custom build. I wanna make sure keeping up with traffic is no problem. Where I live now is right off of a major route. People drive well over the speed limits 70mph and up. I know you love the midbikes,,superbikes and other midsized bikes but in the case of your last statement have you considered getting a real streetbike ? Not that Im saying that real streetbikes are safer because I just had a friend killed by a girl running a stop sign while texting a week ago but they do have the get up n go aswell as better visibility for the street not to mention the westhampton track used to have streetbike race classes from 250-600cc........Maybe by you too..
Last edited by CAM2; 12-12-2016 at 02:07 PM. Oh yes all the time everytime.... The main reason I don't. I know the chances of me ending up seriously hurt. Definitely will increase since every time I see a turn. It looks like a track to me.......lol Hell I won't even get a fast car anymore. I will take some vids one day. The serious elevation changes,quick switch back section and sweeping uphill turns. It's unbelievable! swheels, keeping the dream alive, keep on truckin dude, lol. CAM2, sorry to hear the bad news, lost two close high school friends on motorcycles, they turn left and then say, I didn't see you, Sad. Smarts phones and cars don't mix, its an accident looking for a place to happen. I still have his 900 Kawasaki engine, he wanted to be buried with his motorcycle, but they won't allow that. Late some night going to put the engine next to his head stone. Sorry to hear about you guys lost. That's never a good thing especially when it's no fault of their own. Yes epr I've been trying to and had plan to get away. After I finished up the last 2 bikes.....lol came across this thing for peanuts. I only wanted it for the fairings.... Then I seen much more potential than I could've gotten out of the mids. Yep Cam I remember the Phoenix line of bikes. I wanted to get my hands on one also.... Passed on it wish I didn't though. This thing is about the same size or a little bigger. It's definitely bigger than the ysr's and metrakits. I took some pics for some size references. The smaller bike in the pic. Is a little bit bigger than a ysr. An inch taller seat height and longer wheelbase. It doesn't look like it do the the smaller wheels and x18 seat/tank section. Holy Cow, looks like my place, pocket bikes everywhere, lol. I still see my favorite, the all alum frame w/ gold upside down forks., super pocket bike. Sounds like me, I get started on one project, which gets stalled by a bunch of new projects, lol. I got to finish some and sale some stuff so I can build another one, lol. Alls I know is I stopped the build of my Diablo kit car 15 years ago in 2001 and after the GSXR1000 project its definately next..Then my Triumph. Last edited by CAM2; 12-15-2016 at 12:11 AM.